Wide variety of jewelry, glasswares, terrariums, candlesticks and more. Get Free Shipping when you purchase over $150. FREE UPS Ground shipping within Continental US on $125+. Applied at checkout. Valid online only. Restrictions apply. Get $10 off $100. Brand restrictions apply. 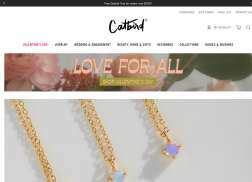 Get free Catbird Home & Lounge signature tote bag with your purchase of $100 or more.